It is the height of summer a dark shadow falls across Exmoor. Children are being stolen from cars. Each disappearance is marked only by a terse note – a brutal accusation. There are no explanations, no ransom demands… and no hope. Policeman Jonas Holly faces a precarious journey into the warped mind of the kidnapper if he’s to stand any chance of catching him. But – still reeling from a personal tragedy – is Jonas really up to the task? Crime writer Val McDermid declared Belinda Bauer “the most disturbing new talent around” on the strength of her 2011 second novel, Darkside. 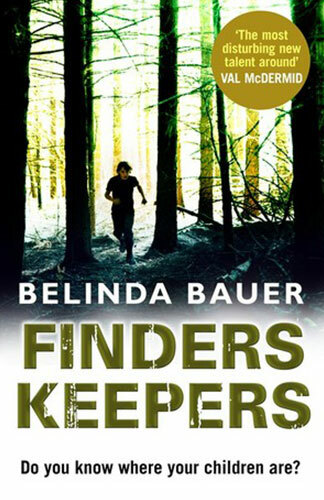 Transworld recycles McDermid’s praise on the front cover of Bauer’s third novel, Finders Keepers, while neglecting to tell readers new to Bauer that this is the third book in the Exmoor trilogy. Never mind. Finders Keepers can be read as a stand-alone. You don’t have to know the traumatic details of certain characters’ earlier experiences in and around the village of Shipcott to be able to appreciate this psychological crime thriller. Bauer’s focus here is the hunt scene in south-west England. Although hunting of animals using hounds was outlawed in the UK in 2004, hunts survive, participants getting around the ban by using trails: that is, laying lines of false scents for the hounds and riders to follow. Some hunts have had to merge or close down, leaving behind aggrieved long-time hunters and employees and disused facilities such as large kennels. The gruesome third part of Bauer’s tale of serial kidnap plays out in a remote kennel with its own abattoirs for the butchering of meat for the hounds. Parts one and two move at a pedestrian pace as, one by one, children left alone in vehicles are abducted. First to vanish is thirteen-year-old Jess Took, daughter of the joint-master of the Midmoor Hunt. Local policeman Jonas Holly, who has been off on leave since his wife Lucy was killed, makes a shaky return to duty to join what is now the hunt for a teenager. Jonas’s psychologist has been reluctant to sign off on the documents authorising his return to work; and a neighbourhood youth, Steven, believes it was actually Jonas who murdered Lucy. Next to vanish, in chapter six, is a nine-year-old boy, a member of one of the many families who travel to the moors for their summer holidays. By now the national media are alert to the developing drama, and leading the press pack is a veteran Australian-born freelancer, Marcie Meyrick. If Bauer was hoping to win Aussie readers when she introduced Marcie earlier in the trilogy, she didn’t go about it in the most flattering of ways. Marcie is thick-skinned and adept at elbowing rivals out of her way. She gathers information by means of ‘nasal, mosquito-in-the-ear wheedling’ and doesn’t hesitate to scaremonger. By the time a third child is abducted the perpetrator has been nicknamed the Pied Piper. As the police investigation proceeds in its slow fashion, Steven’s relationship with his first-ever girlfriend – the daughter of a much more affluent family than his own – progresses slowly too. So does the attraction Detective Sergeant Elizabeth Rice is feeling toward the emaciated, brooding Jonas Holly. It’s URST – unresolved sexual tension – all round.